It's that time of year again, y'all! I can't believe it. One of my greatest joys in running Oh, Sweet Joy! is featuring handmade shops, creative businesses and independent boutiques that work so hard to create amazing products. Along those same lines, it's great for me to share these shops with people/readers not necessarily within this "handmade/blogging bubble" to find wonderfully unique gifts for their loved ones. 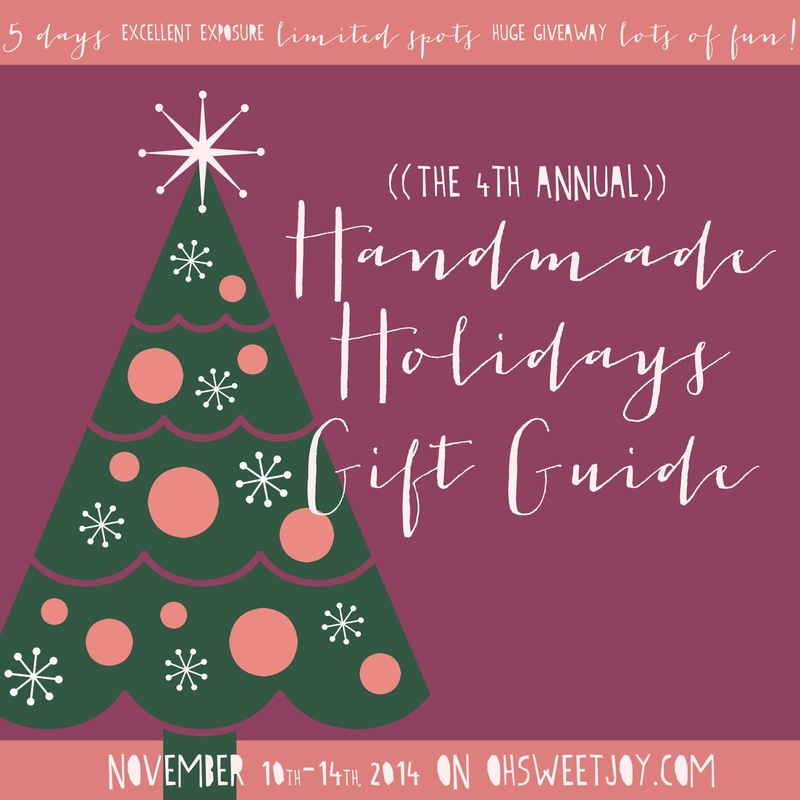 The FOURTH ANNUAL Oh, Sweet Joy Handmade Holidays Gift Guide is the perfect solution to help me do both! The Gift Guide Giveaway alone received over 15,000 views last year. My following has grown tremendously since then and that will definitely benefit you during this holiday promotion! Since the gift guide stays up as part of my searchable blog content, your handmade wares can be seen by over 180,000 viewers by the end of year (based on typical blog traffic). I am opening less spots this year (as in - half of last year's amount), to make it more exclusive, more viewer friendly and mostly - more "do-able" for me. Handmade shops, small businesses, online Boutiques and the like - you WON'T want to miss your chance to be a part of the FOURTH annual Handmade Holidays Gift Guide! After that? We will have a GIANT giveaway. Weeee!! The fee for each participating shop will be $75 (most shops will only have to sell a couple products to make that back!) and will be paid via paypal. Your Gift Guide feature includes more than just a spot in the gift guide (details upon acceptance, but think social media mentions, product pins, ad space, IG shout outs and more!). Shops will also be asked to supply a discount code for the "Handmade Holiday" Gift Guide readers to encourage sales. You can see the general idea of layout of the Gift Guide posts here. Participation in the finale giveaway is recommended, but not mandatory. This is SUCH a great way to drive extra traffic to your shop during peak shopping months. You will be exposing your shop to not only my faithful readers, but also to every other participating shops' "fans" as they tell their customers about "Handmade Holidays!" Want to be included in the fun? NOTE: this is not a giveaway, but simply a gift guide in the form of a highlight and feature. The giveaway is optional for participants.